In the 21 years since Major League Baseball granted an expansion bid to Arizona Baseball, Inc., the Arizona Diamondbacks franchise has been characterized by the stability of its leadership. The franchise has had two managing general partners, the term it uses for its chief executive officer: Jerry Colangelo (1995-2004) and Ken Kendrick (2004-). The actual ownership of the club has been far more divided. Dozens of investors backed Phoenix Suns executive Jerry Colangelo’s original ownership group, Arizona Baseball, Inc., in 1995. Ken Kendrick leads a four-man ownership group that also includes Jeffrey Royer, Michael Chipman, and Dale Jensen, all of whom have owned at least a portion of the club since its inception. In contrast, the Diamondbacks’ on-the-field performance has been consistently inconsistent ever since those heady early years. The team was a near-immediate contender for a world championship. Despite the Diamondbacks’ more recent struggles in the standings, the steadiness of its leadership transformed the franchise into one of the National League’s most respected almost immediately. 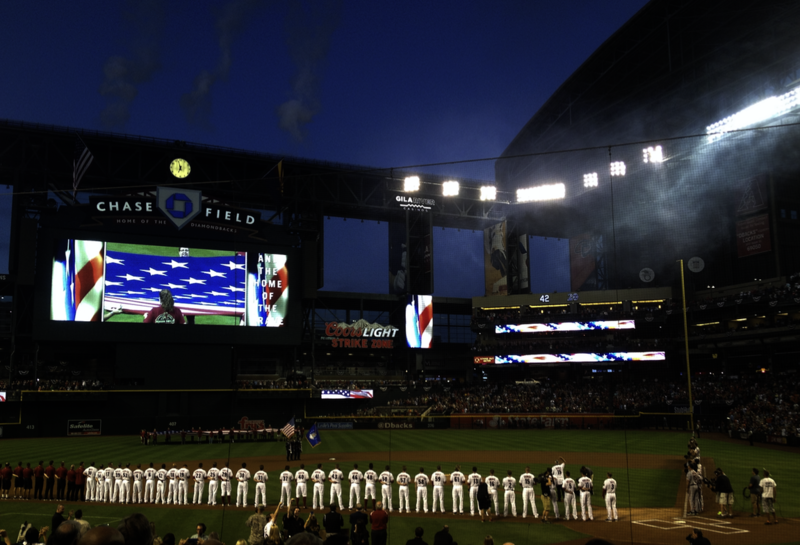 The National Anthem is played before the Arizona Diamondbacks game on April 6, 2015, at Chase Field in Phoenix, Arizona. The arrival of major-league baseball in metropolitan Phoenix in 1998 was preceded by a half-century of close ties between the Valley of the Sun, as Phoenix and 9,200-square-mile Maricopa County are widely known, and the big leagues. The Arizona State University baseball program has been a national collegiate power since the mid-1960s. As of 2016 the Sun Devils have won five NCAA championships, appeared in 22 College World Series, and produced numerous major-league stars, including Reggie Jackson, Bobby Bonds, Dustin Pedroia, and Bob Horner. Since 1992, metropolitan Phoenix has hosted the six-team Arizona Fall League, which provides outstanding minor-league prospects with the opportunity to play in a highly competitive atmosphere once their Double-A and Triple-A seasons have concluded. In 1989 the eight-team Cactus League was in danger of losing one of its founding members. The Maricopa County Stadium Authority, which was created to save the Cactus League, played a similarly decisive role several years later in the arrival of the Diamondbacks by providing the region with a public institution capable of financing a ballpark costing several hundred million dollars. The first concerted civic effort to secure a major-league franchise began as metropolitan Phoenix, with almost 2 million residents, became the nation’s 14th largest metropolitan area in the late 1980s. Martin Stone, the owner of the Phoenix Firebirds, the San Francisco Giants Triple-A affiliate, was the driving force behind the push. Beginning in the mid-1980s, he sought either an expansion team or a relocated franchise. It was no secret that Bill Bidwill, owner of the NFL’s St. Louis Cardinals, intended to move to Phoenix. Stone persuaded Bidwill to join him in building a stadium in the downtown area. While Martin Stone spent a half-decade in single-minded pursuit of big-league baseball for the Phoenix area, the bid that actually brought a major-league team to Arizona came together more serendipitously. 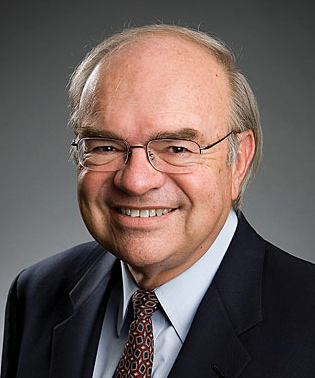 In early 1993, Maricopa County Supervisor and longtime baseball supporter Jim Bruner began discussing the idea of putting together a bid for a forthcoming new round of expansion with a friend, Phoenix sports attorney Joe Garagiola Jr., the son of the baseball personality, player, and commentator. Later in 1993, Bruner and Garagiola set up a meeting with Phoenix Suns owner Jerry Colangelo, one of the region’s most popular public figures and fervent boosters, to discuss their idea. Colangelo’s Suns had engendered unprecedented enthusiasm in the region for professional sports with an exciting run to the NBA playoff finals that year. Bruner and Garagiola persuaded Colangelo to spearhead the effort to bring in a baseball team. Taking on this role required Colangelo to manage a $125 million fundraising drive to pay the anticipated franchise fee for the 1994 expansion. Moreover, Colangelo took on the responsibility of negotiating a public financing deal for a downtown baseball stadium. Colangelo’s rags-to-riches story was well known to Arizonans with even a passing knowledge of professional sports. Born the son of Italian immigrants in a hardscrabble section of Chicago Heights, Illinois, Colangelo Colangelo made use of his athletic and intellectual abilities as well as his unparalleled work ethic to become a great success. A high-school basketball star, Colangelo gained an athletic scholarship to the University of Illinois, where he captained the basketball team and earned All Big-Ten status. After graduating in 1962 he eventually found work with the NBA’s Chicago Bulls and rose quickly through front-office positions. By the time he left the Bulls six years later, Colangelo was the franchise’s director of marketing and its chief scout. Ballpark deal in hand, Colangelo made his expansion pitch to major-league owners in February 1994. He emphasized the booming population of metropolitan Phoenix, the region’s history of enthusiastic support for collegiate, spring-training, and Fall League baseball, and his history of managerial success with the Suns.19 A few days later the owners awarded Arizona Baseball Inc. an expansion franchise. (They also awarded a franchise to a Tampa-St. Petersburg-based ownership group led by businessman Vincent J. Naimoli.) They were to begin playing in the 1998 season. Displeasure with the direction of the franchise led to Colangelo’s ouster as managing general partner by the other four general partners in Arizona Baseball Inc. in August 2004. Garagiola followed Colangelo out the door in 2005. Ken Kendrick, who had been a managing partner since the franchise’s origins, took over as managing general partner. As of 2016 Jeffrey Royer, Michael Chipman, and Dale Jensen remained the other general partners. CLAYTON TRUTOR is a history instructor at Northeastern University's College of Professional Studies. He is also a PhD candidate in US History at Boston College. He has participated in SABR's Biography Project since 2012. He is a staff writer for "Down the Drive," SB Nation's University of Cincinnati athletics website. You can follow him on twitter @ClaytonTrutor. 2015 Chase Field photo by Jacob Pomrenke/SABR. 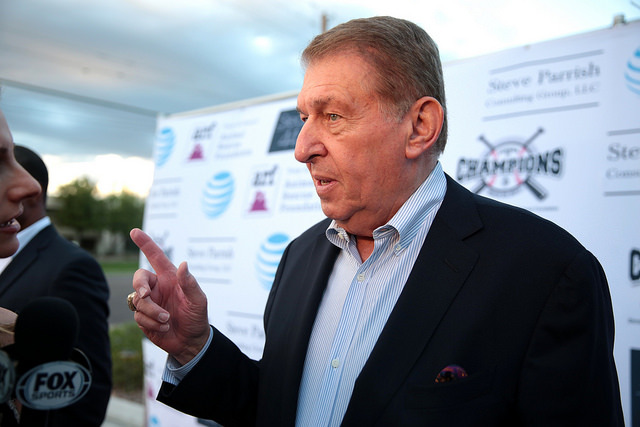 Jerry Colangelo photo on March 22, 2017, was taken by Gage Skidmore. Used by permission under Creative Commons license (CC BY-SA 2.0). Ken Kendrick photo courtesy of the Arizona Diamondbacks. 1 Rick Thompson, “A History of the Cactus League,” Spring Training Magazine, March 1989. Accessed on June 17, 2016: springtrainingmagazine.com/history4.html#cactus ; Gary Rausch, “The Cactus League Is a Major League Tourist Attraction in Arizona,” Chicago Tribune, February 26, 1989, M23. 3 Rick Hummel, “Cactus League Is Coming on Strong,” St. Louis Post-Dispatch, March 7, 2010, C1; Ron Fimrite, “The Selling of Spring,” Sports Illustrated, March 27, 1989, 58-61. 4 Raymond Schultze, “Stadium Developer Quits Deal,” Phoenix Gazette, May 27, 1988, A1, A11; David Schwartz, “Martin Stone Quits Pact for ‘Dome’; Plan in Peril,” Arizona Republic, May 27, 1988, A1, A8; Christopher Broderick, “Agreement Reached on Stadium,” Arizona Republic, April 10, 1987, A1. 6 Robert Barrett, “Stadium Fails, Goddard Wins,” Arizona Republic, October 4, 1989, A1. 7 “Martin Stone”; Bob Cohn, “Race for Big Leagues Begins,” Arizona Republic, June 15, 1990, A1; Eric Miller, “Valley Strikes Out,” Arizona Republic, December 19, 1990, A1. 8 John Walters, “Brazen Arizona,” Sports Illustrated, January 29, 1996, 190-194. 9 Robert Logan, “Colangelo Quits Bulls to Take Phoenix Post,” Chicago Tribune, February 29, 1968, C1; Bob Logan, “Colangelo Has Suns Climbing for Summit,” Chicago Tribune , May 23, 1976, B3; Lee Shappell, “Jerry Colangelo,” Arizona Republic, March 12, 1995, BB2; “Colangelo Took Bait All the Way to Finals”; Kevin Simpson, “The Place to Be,” The Sporting News, November 7, 1994, S3; Jack McCallum, “Desert Heat,” Sports Illustrated, May 28, 1990, 50-51; Joe Gilmartin, “Suns’ Colangelo NBA Executive of the Year,” The Sporting News, May 16, 1981, 46. 10 “NBA Notebook: Pacific,” The Sporting News, October 26, 1987, 47; Steve Wilson, “When You’re Colangelo, You Gotta Believe,” Arizona Republic, January 16, 1994, 10; Norm Frauenheim, “Colangelo-Led Group Buys Phoenix Suns,” Arizona Republic, October 13, 1987, A1, A2. 11 “Baseball Panel Backs Phoenix, Tampa Bay,” Arizona Republic, March 8, 1995, A1, A16; “DBacks Ownership a Mixed Bag,” Arizona Republic, March 30, 1998, C33; Richard Obert, “Floating on Air, Colangelo Readies Big Party Today,” Arizona Republic, March 11, 1995, C1. 12 Mike Padgett, “Decision Cost Jim Bruner His Dream of Serving as U.S. Congressman,” Phoenix Business Journal, March 26, 2008. Accessed June 10, 2016: http://bizjournals.com/phoenix/stories/2008/03/31/story7.html. 16 David Fritze, David Schwartz, and Eric Miller, “Play Ball: Stadium Tax Wins OK,” Arizona Republic, February 18, 1994; “Jerry Colangelo”; Bob McManaman, “Tax Foes’ Name-Calling ‘Hurt Deeply,’” Arizona Republic, February 19, 1994, A20. 18 Mike McCloy, “Supervisor Is Shot,” Arizona Republic, August 14, 1997, A1, A12; William Hermann, Susie Steckner, and Mike McCloy, “Suspect: Tax Spurred Shooting,” Arizona Republic, August 14, 1997, A1, A12; Mike McCloy, “Wilcox Snags 50 Tickets for Opening,” Arizona Republic, March 31, 1998, A1; Mike McCloy, “‘Guy has a Gun’: Guard Acted Fast,” Arizona Republic, August 15, 1997, A1; Frank Fitzpatrick, “Stadium Issues Can Explode: Take Phoenix,” Philadelphia Inquirer, January 13, 1999, E1. 19 Bob McManaman, “Colangelo Winds Up to Make Big Pitch,” Arizona Republic, February 19, 1994, A1, A20. 25 “Arizona Diamondbacks Letter to Maricopa County Board of Supervisors, January 12, 2016,” BallparkDigest.com, March 30, 2016. Accessed August 3, 2016: http://ballparkdigest.com/wp-content/uploads/2016/03/OriginalDbacksletterforChairmanSupervisors03242016.pdf ; “Maricopa County Stadium District: Comprehensive Annual Financial Report,” Maricopa.gov, June 30, 2013. Accessed August 3, 2016: http://maricopa.gov/StadiumDistrict/pdf/MCStadiumDistFY12AFR.pdf; David Fritze, “Boom! Downtown May Fully Awaken,” Arizona Republic, March 12, 1995, BB7. 29 “Cactus League Stadium Guide: Salt River Fields at Talking Stick,” FoxSports.com, February 24, 2016. Accessed June 3, 2016: http://foxsports.com/arizona/story/cactus-league-stadium-guide-salt-river-fields-arizona-diamondbacks-colorado-rockies-022416 ; “Cactus League: Salt River Fields,” azcentral.com, February 24, 2016. Accessed June 3, 2016: http://azcentral.com/story/entertainment/events/2015/02/25/cactus-league-stadium-guide-salt-river-fields-at-talking-stick/24009267/ .